Heat Controller - Now a casement or horizontal sliding window A/C application is practical and energy efficient. 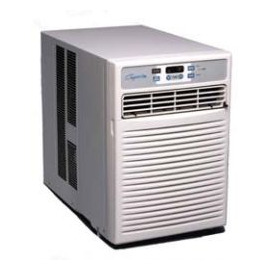 The casement series includes three models with the capacity to cool rooms from 350 to 650 square feet. The series fits windows starting at 15-1/2" wide and ranging from 21" to 42" high. Installation is quick and easy, and each unit includes a kit with a panel to fill window gaps. Decorator front grilles in stone white color are attractive and blend with any decor. Touchpad controls are easy to understand and use, and a handy remote is included. The Casement series features three fan and three cooling speeds with an air exchanger to circulate fresh air into the room. Room Air Casements There are 2 products.